A half-century before the Billy Wilder comedy was acclaimed the best comedy of all time (American Film Institute, BBC poll), the Hollywood Foreign Press Association embraced Some Like It Hot , giving it three Golden Globes, one for best comedy, another for best actor (Jack Lemmon) and a third for best actress (Marilyn Monroe)- sadly, the only award the actress ever won. The film was shot in black-and-white despite studios’ insistence on color (something potential TV audiences demanded.) The screen test of Tony Curtis and Lemmon in drag when shot in color looked so “horrible” the studio had to acquiesce. The movie was a career changer for both Curtis and Lemmon. Curtis became a major industry player, and Lemmon began a long association with Wilder that accounted for some of his best movies (The Apartment). 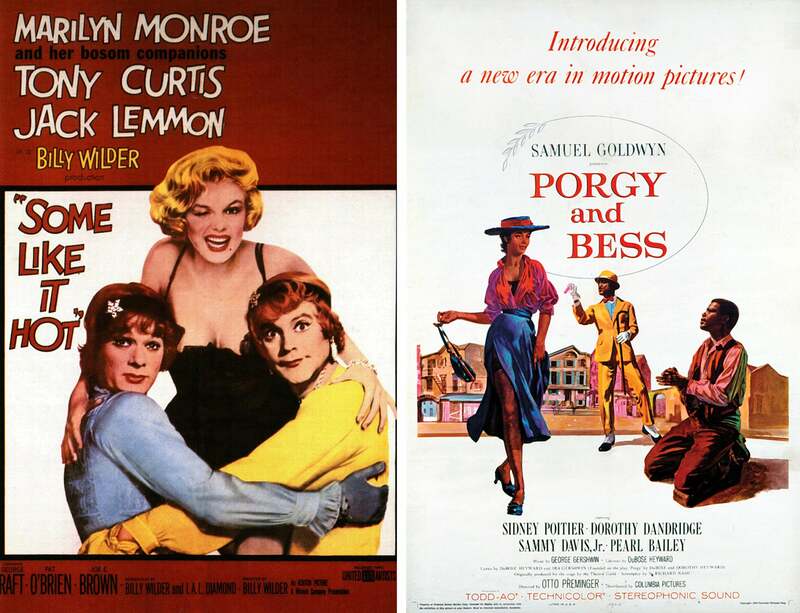 The movie was a runaway box office hit and made a fortune for Wilder, Monroe, and Curtis, all of whom had a percentage of the gross. Porgy and Bess, on the other hand, lost its entire budget and sadly the 1960 Golden Globe Best Musical remained in distribution limbo. In fact, there is no way you can see the film today or in the foreseeable future. When the Gershwins sold the film rights to Sam Goldwyn it came with a 15-year lease, and the Gershwin estate has refused to allow even its DVD release. What a sad turn of events since Goldwyn lavished both his personal fortune and his gilt-edged reputation of making this a timeless transfer from stage to screen. Harry Belafonte was initially approached to play Porgy, but he thought the role demeaning to African Americans, and Sydney Poitier reluctantly replaced him. Other problems ensued. The spectacular set (designed by Broadway’s legendary Oliver Smith) caught on fire and had to be rebuilt. Rouben Mamoulian, who had directed the original Broadway production as well as Oklahoma! and Carousel on Broadway was signed to direct. Mamoulian had also made the classic 1932 film musical Love Me Tonight, but he didn’t get along with Goldwyn and was replaced by Otto Preminger. Goldwyn assembled a great cast including Dorothy Dandridge, Sammy Davis Jr., and Diahann Carrol. But despite his total commitment this, his last film, was a huge disappointment and a box-office failure. You could call it Goldwyn’s folly.